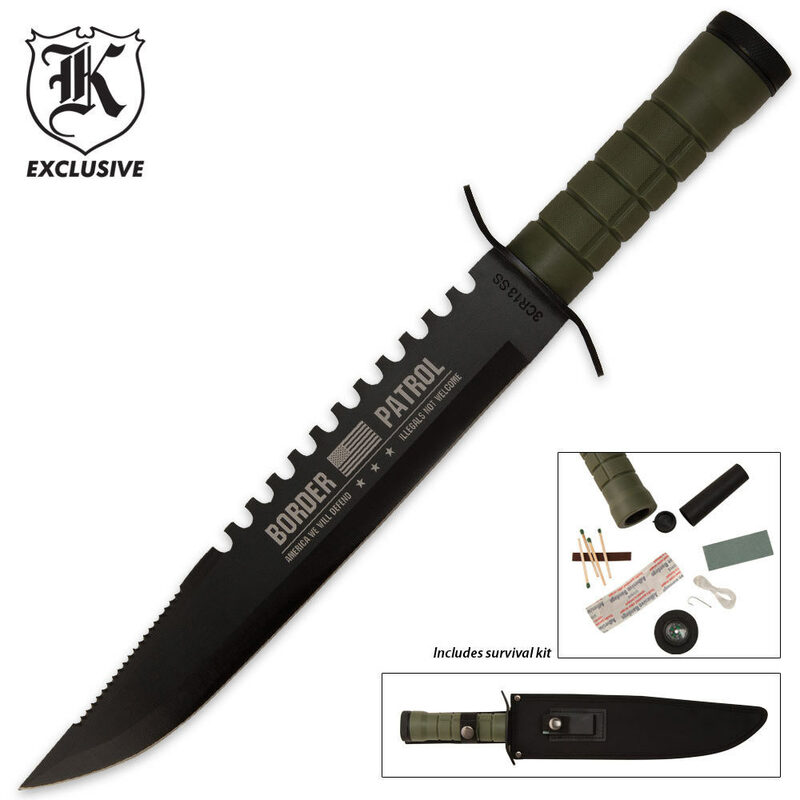 Border Patrol Survival Knife with Survival Kit & Sheath | BUDK.com - Knives & Swords At The Lowest Prices! This Border Patrol Survival Bowie features an exclusive Border Patrol etch that adds to the beauty of this piece! Got 2 of them, Nice looking. Thick durable blade. The edge had a few burrs on the edge. Cuts brush okay needs further sharping and stropping. The hand grip needs finger grooves to maintain hold of knife. It has a tendency to lose grip on a strong strike. The point of blade has pierced the sheath during shipping. I'm going to recover the sheath with camo-ducttape and add a thigh strap to keep the sheath from moving when drawing the knife. Overall, the knife is pretty good just needs a few fixes. Pretty cool knife. It's super big and very sharp out of the box. Great for the price. Just thought of sharping this knife an for it to be able to stand up what you would use it for is great. Keep it with me JUST IN CASE! As a knife and sword collector I was duly impressed with this bad boy. No its not practical if you're truly out in the woods but it comes close. Its big Bowie for sure and the idea of having the survival items in the handle is a good idea. I probably wouldn't use this as my first knife, but it would sure be coming with me. Gotta love the "Illegals Not Welcome" inscription. This is a very impressive knife, I was excited when it came in and I open the box. As I am alone a lot I feel the need to have something by my bed for protection, this makes me feel safe. I like the fact that you can have it engraved with your initials which I did. So now when I'm alone I have my dog and my Bowie knife, so anyone who decides to break in will get one hell of a surprise! I just got this on the BOGO deal. It's NOT high quality by any stretch, but still much better than I deserved for 6 bucks apiece. Neither compass worked, so don't rely on them, even for a back-up. I like their intimidating size, and they would be great for a few uses in a pinch, but mine probably won't see much use around the campsite due to the need to constantly re-sharpen. I jumped on this bogo offer!!! This blade exceeded my expectations in light years. It is so massive but light weight and in my opinion indestructible. All the extras that it comes with will help you in a tight jam. I would bring this everywhere if I could. I love it and would recommend to a friend.